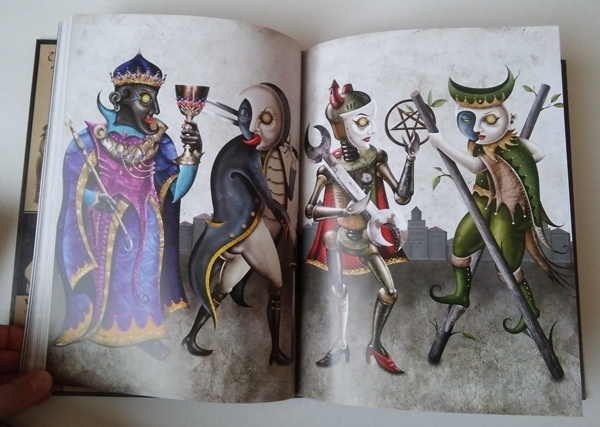 The Deviant Moon Tarot book is a masterpiece. It feels like I had personally asked Patrick Valenza to write me the most wonderful glimpse possible into his artistic process, to discover that he wrote everything I could have dreamed he would, and more, (with added imagery) into his inner psyche, process and growth. 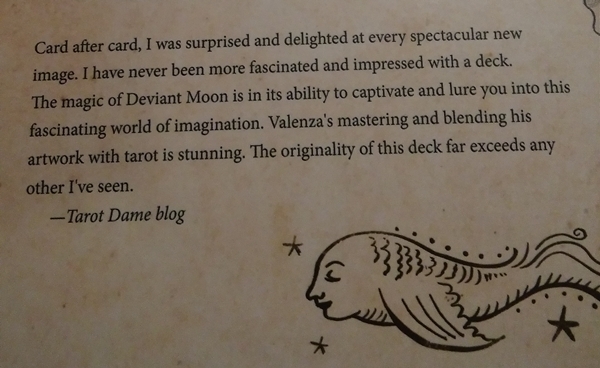 What more could you ask for as a fan of the Deviant Moon deck? 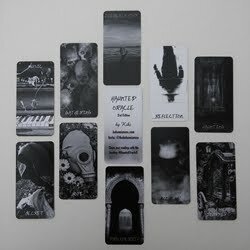 I have been a long time fan of the Deviant Moon Tarot. Having received an advance review copy of the first edition of the deck back in June of 2008, I was a fan from the very beginning. I remember what it was like opening the deck for the first time, discovering each card to be as unique and enchanting as the last. This book is similarly magical, with something new at every turn. First of all, the book weighs a ton. It can be used to knock someone out if you don't have a frying pan handy. It definitely begs to be a coffee table book, because it's not something you want to keep hidden away in a bookshelf somewhere. The artwork is so bizarre and intriguing that it begs to be kept out, available for perusing. 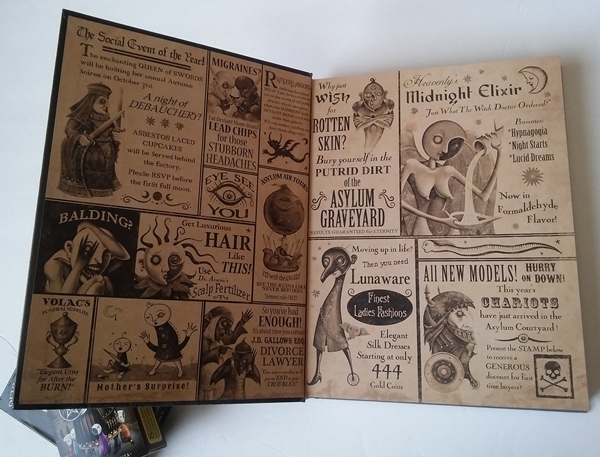 The book itself is beautiful. I love how the black background on the cover contrasts with the bright colors of the cover image. And you can't tell from the above image, but the cracks running through the black background catch the light, enhancing the texture. 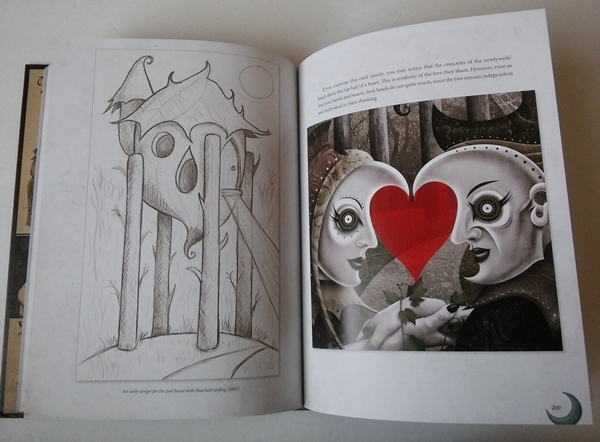 The inside pages are thick and glossy. It measures 8 1/4" x 10 3/4" and is 1 1/4" thick! 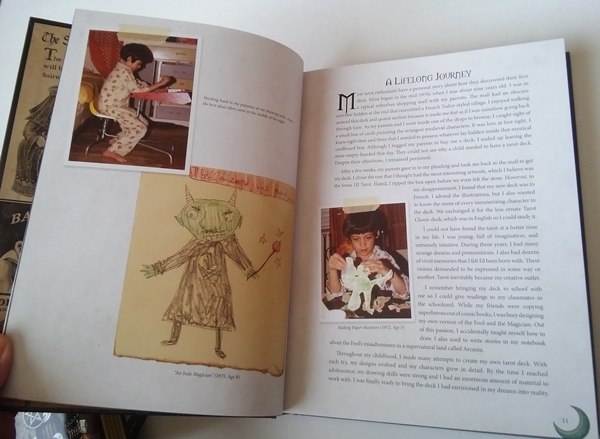 Before you even get to page one, you are treated with delight, for the inside covers are decorated with Valenza's twist on vintage ad throwbacks, using characters from the deck. The ads are different on the front and back, giving you twice the treat! The Hermit's anguished expression appears in an ad for hair elixir: "Balding? Get Luxurious HAIR like THIS! Use Dr. Arsenic's Scalp Fertilizer". The bald hermit (covering up his head) sits beside a character with 8 flowing strands of hair (the gal from the 4 of Swords). It's brilliant how well he matched the characters' expressions with the ads. The couple from the 5 of Cups is featured in an ad for a divorce lawyer. The gal from the 9 of Pentacles models for a ladies' fashion line. One of the ads on the inside back cover features the fella from the Eight of Pentacles, with a humorous advertisement for a terrible job. There are a few sketches that don't accompany ads. There are several curious sketches mixed in with the ads, such as the one simply captioned "Mother's Surprise! ", featuring a sketch of a mother coming to her toddler who appears to have cut off its own arm. I don't understand it, but the message I got was that I don't really need to. Perhaps it's just a bit of oddness for its own sake. One of the most beautiful things about the book is the artist's openness as he shares his childhood memories. He includes photos and sketches from his youth. He shares nightmares and visions, all of which inspired his art. He describes his introduction to the world of tarot at a young age. It's a fascinating read. Valenza shares how his artistry progressed as he aged. There are many images shown, evolving as the artist himself did, at different ages. I was awed at how talented he was as a young teenager. It feels like an honor, to be privy to the deck imagery at various stages in the artist's life. It's like a backstage pass, a behind-the-scenes look at a lifetime of work. 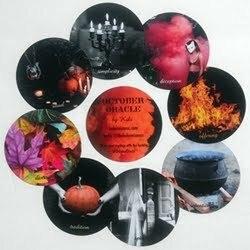 Another fascinating aspect of the book is seeing the sources of much of the imagery in the deck. Many of the backgrounds and textures come from graveyard tombstones and abandoned asylum structures. It's gothic in the most wonderful way. There are so many details I want to talk about, but I am holding back, so that you can have the delight of discovering so much of it on your own. 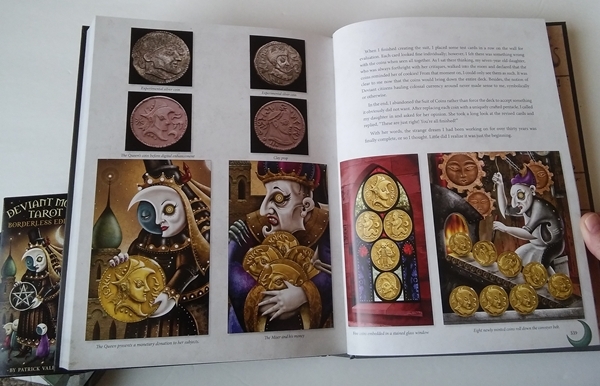 The bulk of the book gives detailed information on each of the cards' meanings, both upright and reversed. 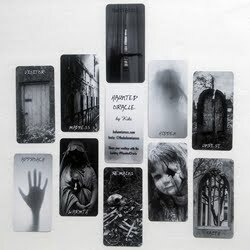 You get incredible insight into the imagery on the cards that wouldn't fit in the LWB that comes with the deck. 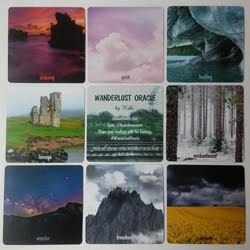 Every card gets a full page color image. 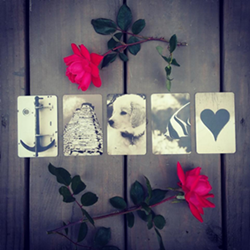 There is always something extra given with each card, be it an original sketch, a photograph relating to its inspiration, or a separate background story. For example, the image above is an excerpt from the King of Wands pages. On the previous two pages, you'll find a full page color image of the card, followed by a full page description of the imagery on the card. On the next two pages (shown in the image above) are sketches of the characters and upright and reversed meanings of the card. This is then followed by an additional tidbit. 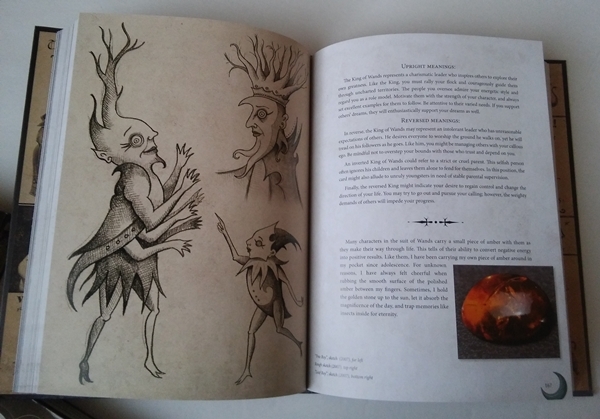 There is a photograph of a piece of amber, and details on why many of the characters in the Wands suit carry amber with them. 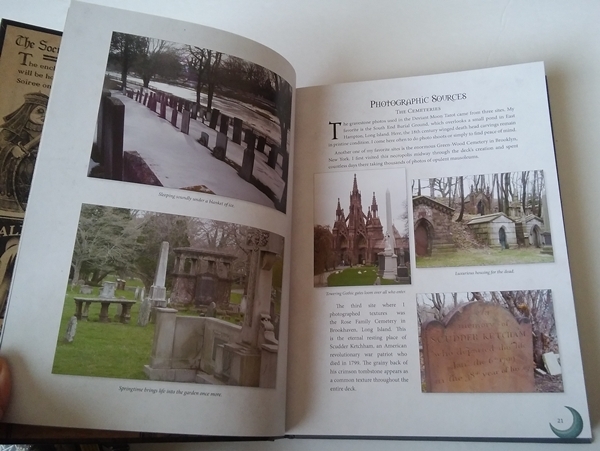 These little extras that you will find throughout the book really give it that something extra special. One of my favorite cards in the deck is the Four of Wands. I have always felt drawn to that little hut on stilts. So I was delighted to see the preliminary sketch, along with the imagery of the heart made in the shape of the two heads coming together. It's something I probably never would have noticed on my own. This book is absolutely chock full of extra details that will enrich your reading of these cards, mostly in the descriptions of the cards themselves, but also in these extra tidbits he shares. When you get to the end of the book, just as you think your journey is over, you discover the last few pages are dedicated to The Lost Suit of Coins. Oh, how I loved this! The artist originally created clay coins to be used as the suit symbol, rather than Pentacles. The coins are gorgeous, and part of me really wishes he had kept them. I am so happy that he shared this bit with us, because even though he decided to stick with pentacles, it's delightful to see the beautiful alternate universe for this suit. I haven't finished reading this book, which is good for you, because I am forced to keep many things secret, thus enhancing your own reading adventure. This book is not something I wanted to rush through. I want to savor it, to make it last a long time, to pick it up every once in awhile and read a little more, glean a little more magic out of it. I know I will be sad when I come to the end of it. I know I will be left selfishly wanting even more. So for now I am savoring it bit by bit. It's a perfect book with which to disappear under a blanket and cup of tea. I can feel with every paragraph I write that I sound like an overzealous fangirl. I have no shame in that. This book deserves every bit of the gushing it receives. In all my reviews, I like to include the bad with the good, for an honest, well-rounded review. But I have nothing negative to say about this book whatsoever, other than the fact that it comes to a conclusion after 340 pages. And I can honestly and safely guarantee I won't have changed my mind about that after having read every word. 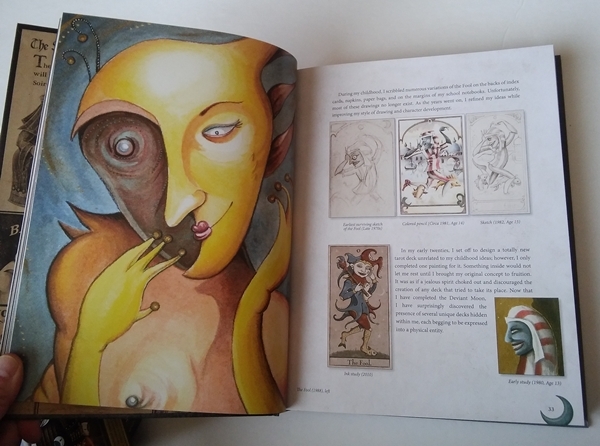 You don't have to own the accompanying tarot deck to enjoy this book, but if you don't already have it, this book will make you want it! Please note that the image at the top of this post shows the book with the two different versions of the deck (original and borderless), but the decks are sold separately. The book is sold alone. In summary, it should be fairly obvious that I can't recommend this book highly enough. I will end this review as I began it, expressing again, wholeheartedly, that it is a masterpiece. 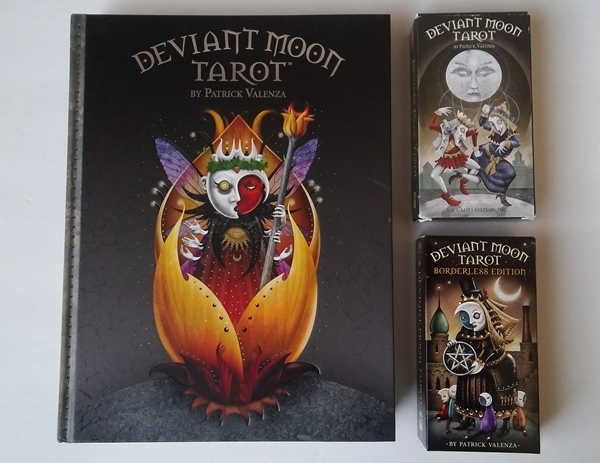 Book: Deviant Moon Tarot by Patrick Valenza, published by US Games Systems, Inc.